Drinking lemon water first thing in the morning is a great way to start your day. Join me and make it your new morning ritual. A squeezed lemon in warm water first thing in the morning helps your body reduce the amount of phlegm in your body and helps to increase alkalinity of your water. It also helps with digestion. The warm water serves to stimulate the gastrointestinal tract and peristalsis—the waves of muscle contractions within the intestinal walls that keep things moving. Please don’t use the lemon juice bought from the grocery store. Use your own fresh lemons. Make sure you squeeze the lemon juice directly into the water as soon as you cut it. Lemons help support your immune system and thus, protects you from the clutches of most types of infections. It also plays the role of blood purifier. Lemon is a fabulous antiseptic bestowed on us by Mother Nature. Do something for your health and take time for this morning health ritual. 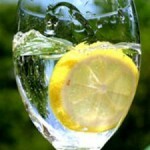 When life gives you a lemon… squeeze it, mix it with six ounces of distilled water and drink twice daily.